The amazing thing about Director’s Chairs is that they can last forever! I have many people call us quite often saying that they have purchased a Gold Medal Directors Chair from a yard or estate sale and it needs new canvas. Well, the amazing thing is that Gold Medal started making Directors Chairs in 1892. In fact, at the 1892 World’s Fair Exposition in Chicago, the Gold Medal Classic chair was awarded a medal for “Excellence in Casual Furniture Design.” Today, this Gold Medal tradition is carried on by TLT Incorporated. So, that brings us back to the fact that there are alot of old, but perfectly serviceable and attractive, directors chairs out there that need new replacement canvas. I will talk a little about how to find the right canvas replacement, and how to install it. Let me say in the beginning that there is no standard for directors chair replacement covers. It is not like nuts and bolts with standard measurements. Manufacturers have made wide and narrow chairs, tall and short backs, etc. Don’t despair though, I have found that 95% of the chairs out there use a couple of sizes available today. The first thing you might want to check is if there is a manufacturer brand name stamped on the chair somewhere. A common place to look is under the arm rests. Or there might be a metal plate attached to the legs or seat rail. If you are able to find this, then you can do a search for the manufacturer and see if they sell replacements. Then, you need to know if you are looking for a Flat Stick or a Round Stick type canvas. I have drawings below showing how the canvas attaches into the seat rail. The flat stick seat fabric is normally wider than the round stick, because the sticks set into the outside edge of the seat rail. One trick I have found is that if you have a wider round stick chair, you can buy the flat stick and just change out the sticks. If you don’t have the round sticks, just go to the hardware store or Wal-Mart and purchase a wooden dowell slightly smaller than the slot and cut it a little shorter than the canvas (so it does not go past the seams). Next, you need to know the dimensions of the canvas you are looking for. If you have the old fabric, then it is easy to measure the seat and back canvas. Lay them out flat, pressing down flat the loops on the back canvas, and measure the two dimensions. Include the area for the sticks, just measure from edge to edge. But be careful here, because that well worn fabric has probably stretched over time. If you don’t have the fabric, then it will take two people to do the measurement. Open the chair frame and lock the brace on the legs. Have one person push the two seat rails together with medium force, and then measure to the outside of the slots. For round stick canvas, you will add about an inch to account for the two stick loops. Now that you are armed the measurements, you can search online for a retailer of replacement directors chair fabric. EverywhereChair.com sells high quality 20 oz. cotton canvas in 12 different colors. Our other supplier, Telescope Casual, sells round stick canvas in 19 colors, and flat sticik canvas in 8 colors. In addition, they make a synthetic mesh directors chair seat and back, which is perfect for outdoor pool use. Telescope also manufacturers a padded directors chair cover, as well as a marine theme directors chair replacement canvas. The dimensions should be listed on the website, if not call customer service. If the operator does not know the dimensions, or worse yet, if they tell you that theirs will fit all directors chairs, then RUN AWAY! They don’t know their products or chairs and probably will not take the item back should it not fit. So, ask about the return policy in case you have to send it back. As long as it is in new condition, there should NOT be any restocking fees, these are very easy to resell (also, please cut the plastic bag with a scissor, so it can be taped back without notice). If the dimensions you have measured are not exactly what they have, don’t worry, it only has to be close, say +/- one inch. That applies mainly to the seat canvas width, which determines if you will be able to open the chair (too narrow) or the fabric will sag too much and possibly come out when sat in (too wide). So go ahead and order the directors chair replacement set (it will include the seat and back canvas and the sticks) and start thinking about where you are going to put your handsome new directors chairs. This might also be a good time to refinish the chair frame. If you do, be careful not to put finish in the slots where the canvas will go. When your package arrives, check your order for accuracy and then get the chairs ready for new canvas. Open the chair frame about half way open so you have slack to put the canvas on. Put the seat on first – by inserting the sticks in the fabric. Then, slide the seat evenly on both sides into the seat rail slot. Even up the front of the canvas with the chair front. If it is hard to go in, check that the sticks are not past the seams, if so, then cut the sticks off just inside the seams. You might have to get a smaller dowell (remember, the hardware store has these) if it is too large with the fabric. Once you have the seat in, slide the back canvas over the posts and leave about a half inch of post at the top. Next, open the chair all the way, pushing apart the seat rails, and then STEP ON THE BRACES TO PUSH THEM DOWN AND LOCK THEM INTO PLACE. I emphasize this because I get so many calls where the customer says the seat is too small, but in reality the chair is made so that the seat fabric locks the braces into place and everything is in tension. That is how you want the chair to be. The back will pull the armrests in so that they push down hard on the seat rails, keeping the canvas from coming out of the slots. You don’t want the canvas coming out of the slot, or you will be on the ground. It also will most likely rip at the seams if the seat is not taunt. So, there you have it. Replacing the canvas on your directors chairs is a great way to be eco friendly, by reusing rather than discarding. Old chair frames can be found on Ebay, yard sales, estate sales, etc. 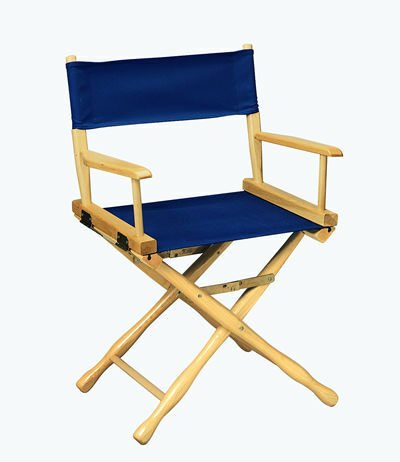 When you find a frame, be sure that the joints are solid – that is the first place where a director chair will show wear. It won’t be long before you are swaying back and forth, not good when you are in a tall directors chair, 30″ off the ground. Good luck on refurbishing those old chairs and call me, the “Chairman”, any time if you have questions.